← Keep Your Food Dollars at Home! Anyone who has read the newspaper is familiar with the Peanuts character Snoopy and his suppertime dance. Snoopy is not alone in his passion for food, as anyone who wanders through our place can attest. Bacon the big boar stands in the feed trough, drooling like a faucet, while the sow tries to shove him out of the way. She might as well try to move a tank. The young pigs run in circles, leap in the air, swap ends and occasionally just fall over in excitement. They bark, grunt, squeal and generally behave as though someone has laced their drinking water with Dexedrine and LSD. 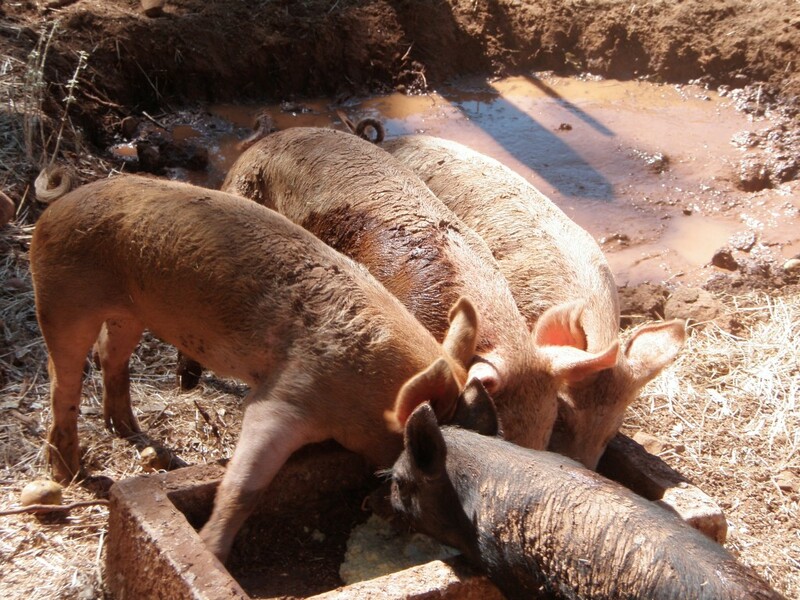 Get too close to the fence as you’re pouring the slop bucket into their trough, and one is likely to reach through and nip at your pantsleg, just to remind you that it’s been a while since breakfast and WE’RE HUNGRY! The sheep, more restrained, approach the fence with eager interest. Should you stand to watch them for a minute instead of immediately tossing their hay into the feeder, they baa encouragement. Once the hay is in the feeder, there are several shoving matches – sheep are firm believers in the law of First Come, First Served and the law of I’m Bigger Than You Are So I Eat First. Eventually everybody settles down in their usual places according to their pecking order, with only an occasional muffled baa as they try to talk with their mouths full. The baby chicks, now about three weeks old, have begun to recognize that people are the source of yummies. However, when they got their first batch of people-food scraps the other day, they crowded into the corner as if menaced by a rattlesnake, talking anxiously amongst themselves while they tried to determine if that new stuff was food or was going to eat them instead. They must have figured it out eventually, as every last bit was gone by the next morning, and now they come running and try to climb in the scrap bucket. Our stallion, like many males, runs on his stomach. Let a cow or calf get between Sox and his food and the stud pins his ears back and makes a dive for the errant fool, mouth open and ready to bite. Cattle scatter, the calves bawling and bucking, and the stallion, who knows how to run a bluff as well as any poker player, snatches a large bite of hay and chews peacefully. Even the wild animals get in the act, although their perspective is a little different. The wild turkeys scatter from the grain hay stack when we come down to feed, chukking their insult at being run off their goodies. Deer watch us from the shoulder high grass, chewing thoughtfully. A bear who wandered down the road several times ignored the possibilities of blackberries or pig for dinner and instead ate the milk cow’s grain. For dessert, he ate the bucket. He did leave us the lid, which was nice of him. Yep, feeding time is all the excitement I need; don’t think my heart could take much more. Jan – ever been near a grocery store when a hurricane or major snow storm is predicted? People get kind of weird in that situation and exhibit some behavior my animals would never even consider! With grocery stores full of food, one can only wonder if humans exhibit similar behaviour.